From music videos to cooking tutorials to yoga and more, YouTube has a video and channel for nearly every interest. The platform offers an easily-accessible way for creators to connect with influencers, fans, and target audiences alike. Brands and businesses are also getting in on the act now and setting aside budgets for YouTube video and ads, hoping to harness the power of YouTube and capture its vast viewing audience. And with predictions indicating that watching videos online will account for 72% of all internet use by 2019, budget for mobile video ads is expected to increase by 70% as a direct result. This YouTube Video Marketing Guide covers everything you need to know about video optimization, video advertising, and understanding the ROI of these efforts. Lights, Camera, Action! When creating a video for YouTube, it’s easy to get caught up in the production stage of content creation. Where the true value lies is creating content with users in mind. Unlike Google search, which takes many signals into account when ranking websites, YouTube measures content quality based predominantly on user experience signals. The more time that users spend watching and interacting with your videos, the higher quality YouTube deems your videos to be. Want to set your channel up for success and give users the experience they desire? Awesome, that’s what we like to hear! 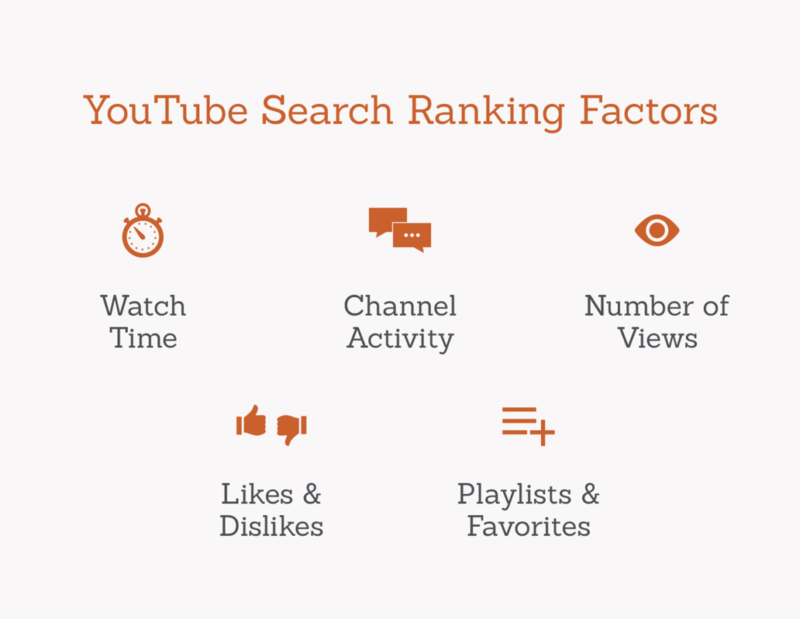 What are the YouTube Search Ranking Factors? Watch time, i.e. the amount of time users spend watching your video is the #1 ranking factor in the YouTube algorithm. Videos with the highest retention rate consistently perform better on YouTube. Watch time benefits don’t evaporate when viewers stop watching your content. The total amount of time a viewer spends on YouTube in a single visit is called a watch session. If a video on your brand’s channel drives them to watch more videos, the channel earns some watch time credits for the cumulative minutes accrued. 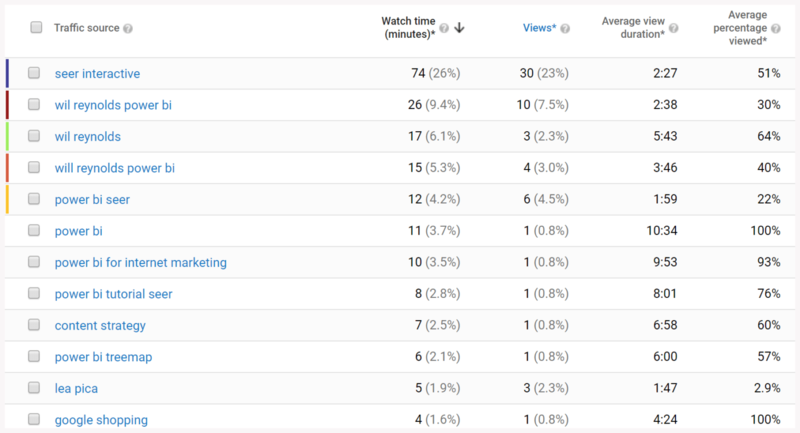 You can view each video’s individual performance for watch time and retention rate in the YouTube Analytics dashboard. Videos should be created in a way that encourages users to watch the majority of the video. Tell them a story! Keep them engaged and wanting more! The analytics dashboard can be used to identify the specific moment where users bounce, adding clickable CTA’s or annotations at this moment is a test that can be performed to check for greater user retention. 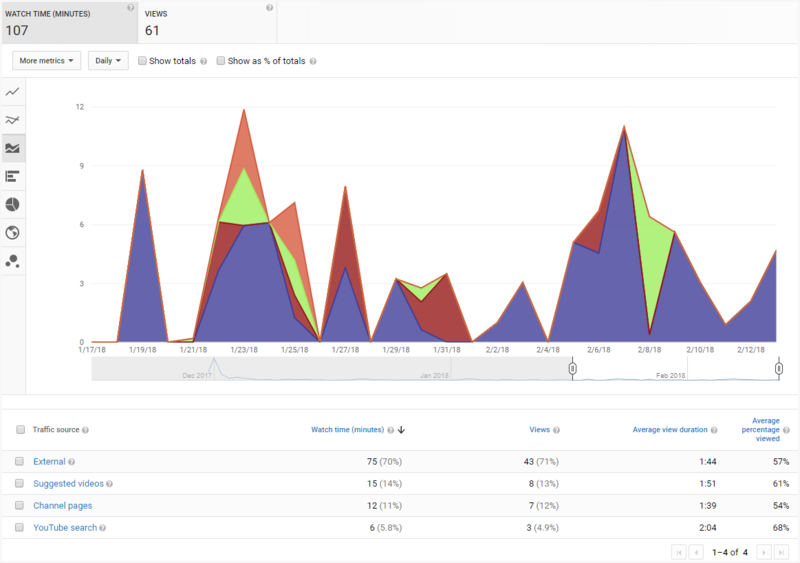 Engagement Reports can be accessed in the the YouTube Analytics dashboard under Audience Retention. Channel activity encompasses the number of comments on a video, audience interaction in the comments, and creator interaction in the comments. YouTube’s algorithm caters to channels that consistently interact with their audience. New comments will appear as notifications in the Bell directly adjacent to the YouTube profile. This makes creators aware of new comments so they can quickly respond to viewers. 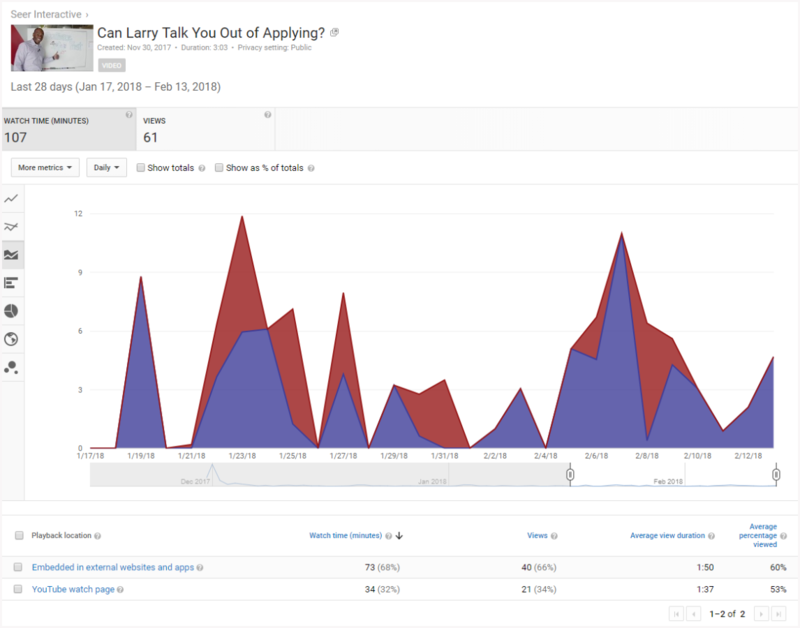 Comment Engagement Reports can be found in the YouTube Analytics Dashboard under Comments. Views are no longer the main ranking factor for Videos. However, views can be used as a metric to measure the overall performance and visibility of a video. 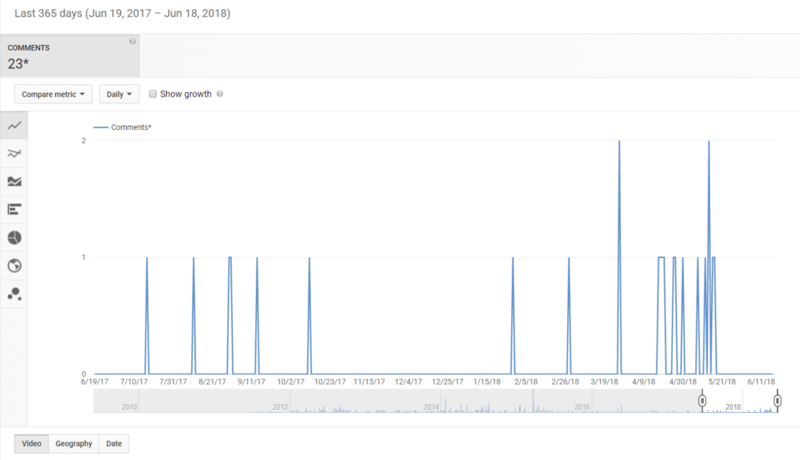 Views can be found in the YouTube Analytics Dashboard under Overview. Likes and Dislikes are a measure of a user’s satisfaction with the content provided in any particular video. These are selected solely by the user. Encourage users to give a video “Thumbs Up” when appropriate. Create content with titles that accurately describe the content of the video to avoid disappointing the user. Likes and Dislikes Reports can be found in the YouTube Analytics Dashboard under Likes and Dislikes. Encourage users to “Favorite” a video when appropriate or it add it to their playlists. Create content that is exceptional enough to encourage repeat viewing. Favorites Reports can be found in the YouTube Analytics Dashboard under Videos In Playlists (Videos in Favorites). Conducting keyword research for YouTube videos varies slightly from conventional search, since the intent of a video query may vary from that of the intent of your run-of-the mill search. For example, if a user types the keyword “Nike air” into Google, they might be looking to solve an information need or buy a new pair of shoes, and the results reflect this. Typing that same query into YouTube will yield reviews, marketing materials, sponsored content, and (sometimes) interesting educational videos. When we conduct keyword research for videos, we should always consider the implicit need of the search, and if the video we are optimizing helps users find the content they’re looking for on YouTube. If you’ve ever used Google’s auto suggested terms to perform keyword research, you’ll be familiar with this method of research. Typing a keyword into YouTube’s “search” field will auto-populate with related searches. This is a simple way to see which terms are being used in the platform and allows us to better understand the intent of YouTube related searches. If you Navigate to YouTube’s analytics platform, select Traffic Sources, and then select YouTube Search as your traffic source, you’ll be able to see the specific terms being typed into YouTube’s search bar that are bringing users to your videos. Incorporating frequently searched terms into your video’s metadata will allow users to more easily discover your content and help you to better understand what, specifically, users are looking for on their path to finding your videos. Keywordtool.io leverages the YouTube autocomplete feature to generate relevant long-tail keywords about your query. Similar to the manual process described above, this tool allows you to export a large number of onsite YouTube search queries. With the free version, you can set negatives, export a CSV of the listed keywords, and filter results within the page itself. There are several YouTube SEO tools out there (like TubeBuddy & vidIQ) that let you access video metadata that’s normally hidden. These tools exist as browser extensions that plug directly into YouTube and appear alongside videos when you watch them. There’s a ton of great information in here, but what we’re specifically trying to see is what the videos have been tagged for. TubeBuddy and vidIQ both allow you to see what a video has been tagged with, and how these tags are performing in the platform. In the example below, our Power BI for Digital Marketers video is ranking in position 8 on YouTube for the term “Power BI”. If you find that a competitor has a poorly optimized video that ranks for a keyword you’re pursuing, you may be able to outrank that video by creating new, highly optimized content or by updating older, high performing content to include the term. Google Trends is another tool that allows you to quickly uncover keyword and search demand insights. There’s a separate function built into Google Trends that allows you to see YouTube specific insights that can be accessed by switching the web search functionality over to YouTube Search. This not only allows you to see the YouTube Specific search trends that are happening, but also the related and most highly searched queries for that topic. Using this research method can help you find the topics users are searching for most often, and will give you insight into when it might make sense to launch a new series of videos based on search demand. So you’ve made a killer video, optimized your script to address audience desires, and are ready to share your content with the world. What’s stopping you?! Before pressing the big red “upload” button, there are a few more YouTube SEO considerations to keep in mind! One step that has the potential to make or break the future success of your YouTube video is making sure it has a title and description that will not only stand out to users, but search engines, as well. By following the steps outlined below and understanding the YouTube search ranking factors, you can set your video up for success! 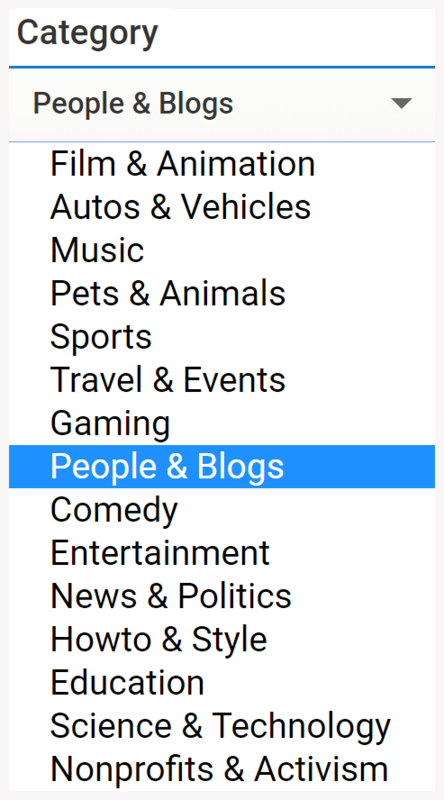 YouTube breaks videos into one of 15 Categories, these can be selected during or after the upload process of the video. It’s important to select the category most relevant to the topic of each video. Sometimes it can be difficult to determine which category your video falls into. In cases where you cannot determine the most relevant selection, try to match your video to a category that makes sense from a semantic standpoint. If you decide later that your video better fits into a different category, these categories can be switched in the Video Manager, under the Info & Settings tab, under Advanced Settings. 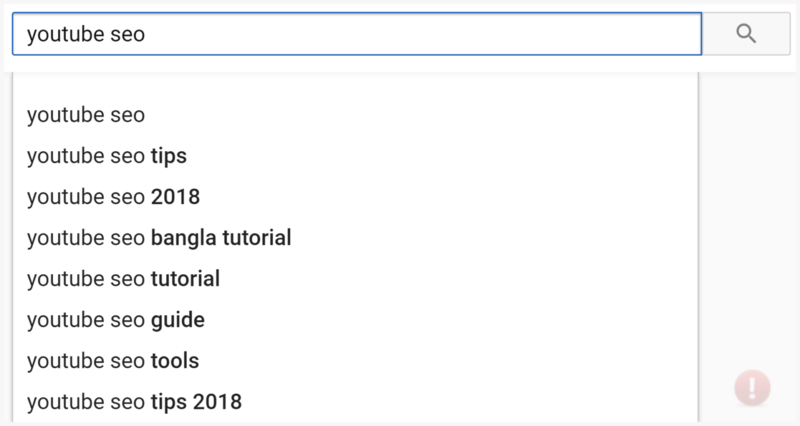 Always create your YouTube titles with search in mind. Use keywords that describe the important elements of each video and that offer a glimpse into what your video is about. Video titles should always contain your target keyword at least once. In addition, the title should be created in a way that maximizes the click-through rate for that particular video—don’t be afraid to challenge, surprise, or shock your viewers! However, it’s important to note that you should never mislead viewers. If you’re creating an interesting title, be sure you have a way to back it up. 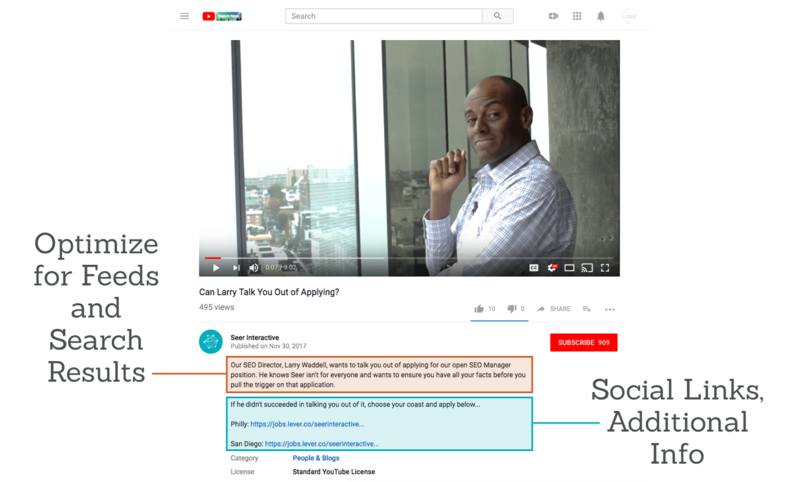 In the example above, our video’s title challenges users not to apply for a job with Seer in an effort to grab the attention of prospective applicants. 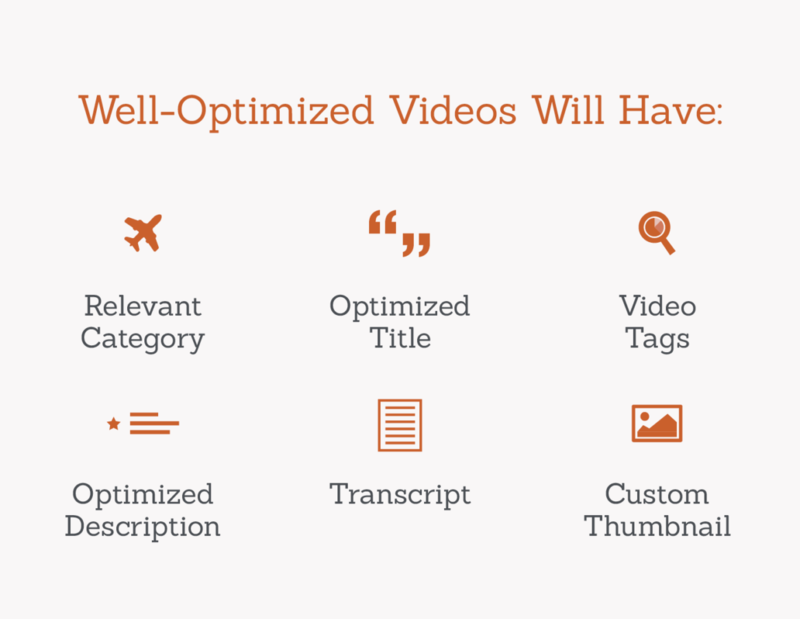 Video titles should remain within 60 to 70 characters to avoid truncation and being cut off. Titles can be edited in the Video Manager under the Info & Settings tab. Adding video tags to your YouTube video is one of the most important steps in getting your video to rank in YouTube search results. These tags help users find your video. When users type words related to your tags, your video has a higher likelihood of being shown, clicked on, and ultimately, viewed by an audience. The best tags for your YouTube video will be determined during the keyword research phase of the project as the target keywords. As your content ages, don’t be afraid to update your tagging structure to reflect current search trends. There is a 270-character limit on Tags. Make sure that yours fit within this constraint. These can be accessed and added via the Video Manager in the Info & Settings tab. Like the Video Title, the Video Description should always be keyword-rich without wandering into the dreaded “keyword stuffing” territory. The introduction should function similarly to a meta description, including your target keyword and the general idea of your video in a way that entices the user to continue reading. Currently on YouTube, the description box breaks into two different portions: the condensed section and the enlarged description box, where all of the “additional” information should go. Optimize the additional space (show more) with consistent branded information. For YouTube in particular, remember to include the “http://” for all links in order to make them clickable. These can be edited in the Video Manager under the Info & Settings tab. Transcripts should be uploaded along with each video. Why? The benefits of doing so are twofold! Your video will reach a larger audience. Closed captioning is only available for videos that have transcripts uploaded with them. In doing this, you are ensuring that your content can be enjoyed by those with impaired hearing as well, thereby increasing your brand reach to your complete audience. When you upload a transcript alongside your video, this enables Google to crawl your video for keywords and additional context about your video to rank better. Not only will it be easier for others to find your video in their search engine, but it’s easier to find for others searching on YouTube, too. YouTube has an integrated caption functionality, meaning that it can provide auto generated subtitles. However, it’s best to have a .SRT file (YouTube’s Preferred Basic Caption File). Including full transcripts can raise the likelihood of your video appearing for a Google Suggested Clip. These files can be uploaded via the Video Manager in the Subtitles/CC tab. Seer has used websites like SpeechPad.com in the past but there are a variety of services that provide similar offerings. Thumbnails and titles are the first things a prospective viewer will see upon finding your video. If your thumbnails and titles are misleading, users will not likely watch your content for long. YouTube encourages creating thumbnails that give an interesting sneak peak into your video without falling into clickbait territory. Upload your image in formats like .JPG, .GIF, .BMP, or .PNG. Once your video has been uploaded, you can check the Audience Retention Report in YouTube Analytics. If there is a sharp decline in viewership in the first few moments of a video, your thumbnail or title may be misleading to viewers. Try updating your title and thumbnail if you observe this to see if it makes a difference. Cards are created in the YouTube Video Manager and allow you to link your video to to an approved URL or to your own website. Cards can be customized with an image, title, and call-to-action. Cards are generally used to showcase a product from a video, drive users to your website, or to promote playlists or other videos from your channel. On a computer signed into a YouTube account linked with your target website, go to your Video Manager. Find the video you want to add cards to and select Edit. Select Cards in the navigation above the video and choose what type of card you want and click Create. Fill out your Card Title, CTA, and Teaser Text, and Start Time. Inbound links (links from other websites to your website or video) are important in terms of traditional SEO. They are also important for YouTube SEO since an embedded video (when a YouTube video’s code is added to a website, displaying the video outside of YouTube) functions like an inbound link. When embedding videos on web pages, add your transcript to the page if there isn’t other relevant content. Avoid creating pages with just an embedded video. Similar to including them on YouTube itself, transcripts help search engines decipher the contents of a video. Consider creating the video into a blog post if relevant, giving users another medium to consume the same content (this may include screenshots or relevant images embedded on the page). Having a video and a web page targeting the same keywords may help a brand rank more than once for relevant keywords. Every time you post a video that’s relevant for general sharing, blog about it, tweet it or add it to your Facebook page. Strong social signals help add authority. Engage with the YouTube Community or with other companies that are relatable to yours. Include a call to action within your video, such as an annotation added to the video or in the description that tells viewers to “like” or share. Embed your most recent videos onto your website or within a blog post. Embedding videos within websites or a blog post will create a valuable way for other visitors to see the content. It can also increase your organic page results for those sites in search engines. 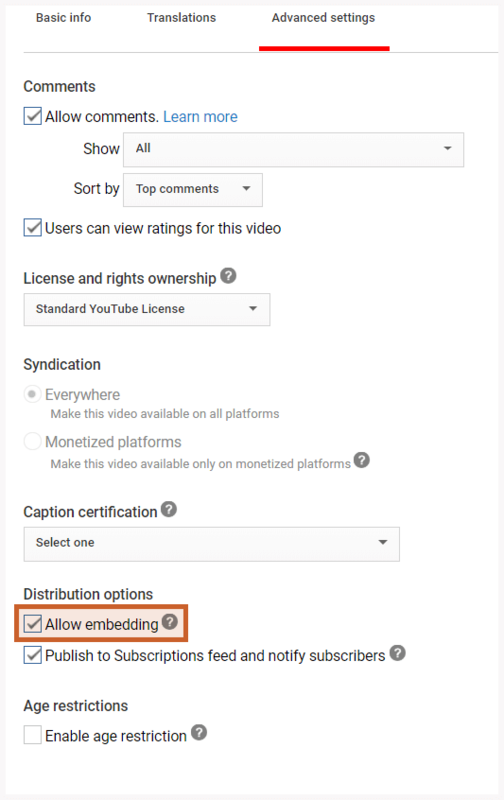 Allow others to embed your videos within their sites by allowing the code to be shared from the video’s page (turn on embed option under Advanced Settings in the video editor). Within your YouTube analytics, you can see how many views each embedded video gets per site. 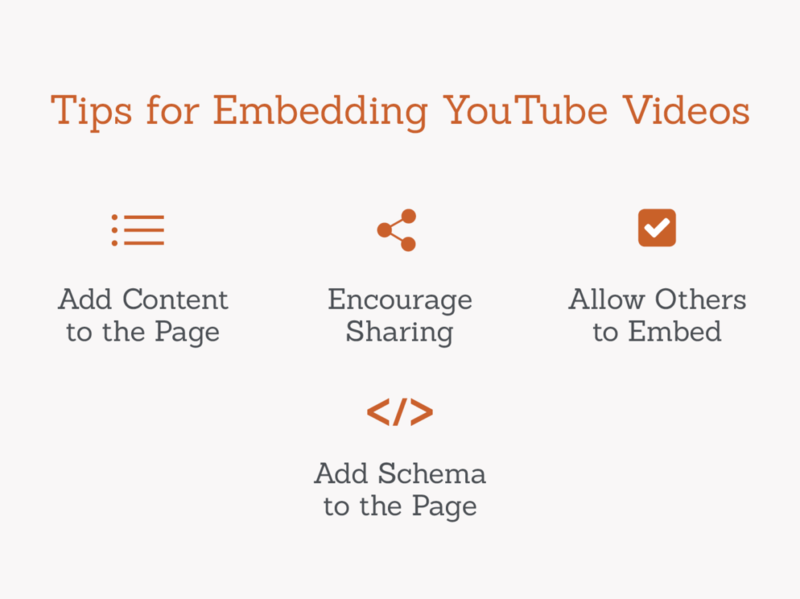 When YouTube videos are embedded on a web page, add Schema markup to help Google determine the content of the video. Relevant markup includes: URL, length, name, description, thumbnail, and upload date. For implementation instructions, Seer suggests visiting Google’s Webmaster blog for a step-by-step guide. Phew! You’ve officially optimized your YouTube video for SEO. Ready to learn more about promoting your video and tracking its performance? Let’s keep the lessons rolling. YouTube advertising allows you to promote your brand on YouTube, giving you the opportunity to differentiate yourself from the competition and find an audience that’s seriously interested in what your business has to offer. Through the magic of a well-done YouTube video, the advertiser is able to connect with their audience in a unique way by showing viewers why they should care about your brand. When running ads on YouTube, an advertiser only pays when someone watches at least 30 seconds or clicks on the video. This is advantageous because it conveys that this viewer is genuinely interested in your brand, making him or her more likely to convert by either visiting your website, subscribing to your YouTube channel or purchasing your product. YouTube Ads are run through Google so businesses are able to track their ads’ progress and make optimizations according to performance along the way. Advertisers are able to measure success by viewing detailed analytics and optimizing from there. As of 2018, YouTube has 1.3 billion users. That’s almost 1/3rd of the 4 billion Internet users around the world! The volume of people you can reach is astounding. In addition to being able to reach a massive volume of people, you’re able to reach the right audience, reaching potential customers by targeting topics, demographics, keywords, and even contextual placements in order to ensure your ad is showing up anywhere your target audience might see. Not to mention, you can navigate YouTube in 88 countries and 76 different languages. “You know, you say a picture is worth a thousand words? Video is worth a million,” raves Njord Rota, owner of Majestic Heli Ski and strong believer in YouTube ads. The viewer is able to see not just your product, but what it represents: Happy customers, memories created, and solutions to problems realized. Brands are able to tell their business story with YouTube ads in a way that connects with the viewer and feels personal. Another huge benefit to advertising on YouTube is the platform’s massive potential for interaction between audience and brand. YouTube allows for a mix of accessing, sharing, and engaging with videos that create emotional connections with a community. YouTube is where 30 million daily visitors turn to be entertained, educated, and expressive. So, why advertise on YouTube? Reach your audience so you can connect with them in a more meaningful way. With all the technology and marketing tools available today, it’s hard to know not only which tool to use to reach your marketing goals, but also when it’s time for your brand to use that tool. Below are a variety of scenarios businesses often encounter that signal it may be time to try advertising on YouTube. The most successful YouTube campaigns involve an organized approach: Setting clear-cut goals, monitoring performance, and pivoting in order to generate a meaningful ROI. YouTube gives advertisers a vast range of tools to measure performance in order to stay on track to meet goals. 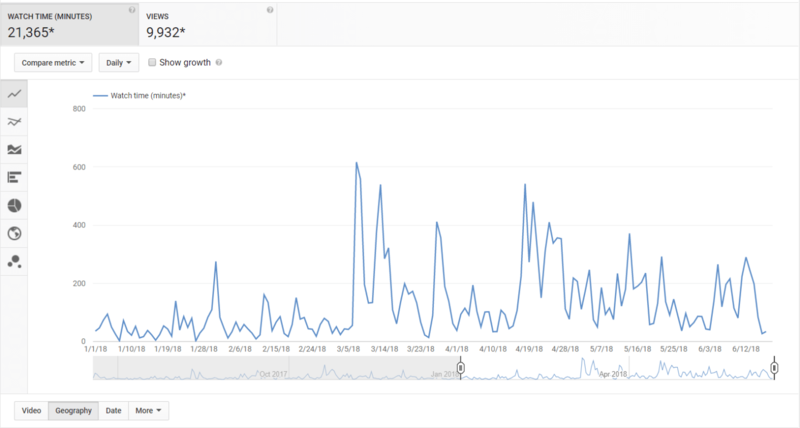 Use YouTube Analytics and Google Ads to track metrics relevant to your end goals. 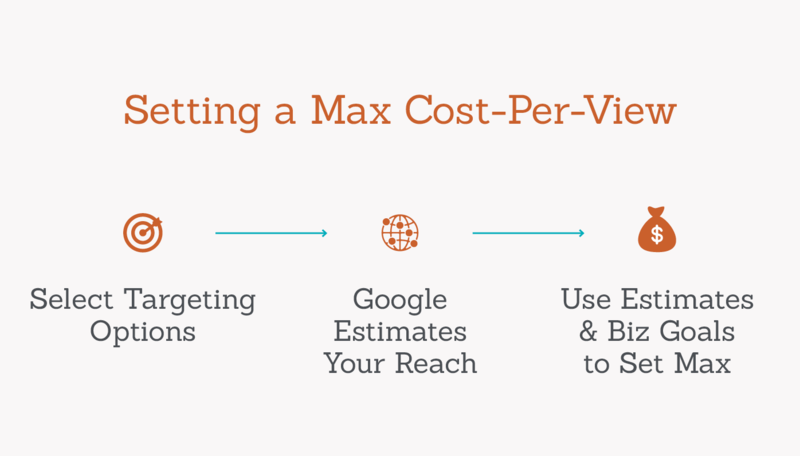 Max Cost-Per-View (Max CPV): the most your brand is willing to pay for someone to view your video. This bid is similar to Max CPC (Cost Per Click). Average Cost-Per-View (Avg. CPV): the average amount you will pay for someone to view your video ad. This metric is similar to the Avg. CPC and is calculated in the exact same way. View: happens when someone either watches at least 30 seconds of your video ad or interacts with your video. To note, this is different than an impression. View Rate: shows the number of views or engagements your video ad receives divided by the number of times your ad is shown (video and thumbnail impressions). Engagements: show the number of clicks on interactive elements, such as on teasers or icons to expand any cards on your video, that don’t take people to a website or other external destination. Engagement Rate: is the number of engagements that your ad receives divided by the number of times your ad is shown, expressed as a percentage. Video Played to (25%, 50%, 75%, 100%): measures what percentage of viewers watched to that point in the video. For example, “video played to: 25%” shows how often a video is played to 25% of its length. Earned Views: this type of earned action increments whether or not someone chooses to watch the same video again or any other video on your channel. Earned Subscribes: happen when a viewer subscribes to your channel. Earned Playlist Additions: happen when a viewer adds the video to a playlist. Earned Likes: happen when a viewer likes the video. Earned shares happen when a viewer shares the video. Depending on your brand’s goals, there are a variety of metrics that can be analyzed when reviewing performance of your video campaign. It’s important to monitor metrics that track campaign success beyond just view counts. Look to other metrics, such as engagement rate and click through rate.Assess if your campaign is achieving your goals by reviewing the performance metrics listed below. Want to generate buzz for your brand? One of the best ways to raise brand awareness is by hammering out a “quick, actionable message” establishing your brand in the user’s mind. These ads are typically unique and memorable, yet to the point. Use Bumper Ads or TrueView In-Stream Ads. If your brand’s website is eCommerce enabled, it’s likely that you hope to drive traffic to the site in order to increase transactions and revenue. With YouTube ads, you can drive users to specific product pages to purchase the product featured in the ad. Use Trueview In-Stream Ads or TrueView Discovery Ads for product and brand consideration. Within these YouTube ad formats, you can utilize TrueView for Shopping. Is your goal to pinpoint and develop prospective customers? Attract those individuals interested in your business with YouTube ads, starting them out in the sales pipeline (top of the funnel marketing). Below are several examples of possible lead generation sub goals, and our recommendation on YouTube Ad Formats to use if your focus is lead generation. Do you want to grow your YouTube presence? Reach new audiences who might not have otherwise known about your channel by using YouTube ads, and establish a loyal audience that will engage with your content consistently over time. Including a Call to Action like “Learn how to make my lasagna on my channel” will entice viewers to click through to your YouTube. Use TrueView In-Stream, TrueView Discovery, or Bumper Ads, especially as remarketing to viewers of past videos. Brand’s Website: direct users to a website URL that’s relevant to the video ad. Choose this destination if you want users to take action on your website. Brand’s YouTube Channel: direct users to your YouTube Channel. Choose this destination if you want to grow your audience and drive engagement on YouTube. Choose this destination if you want to encourage users to make a purchase. 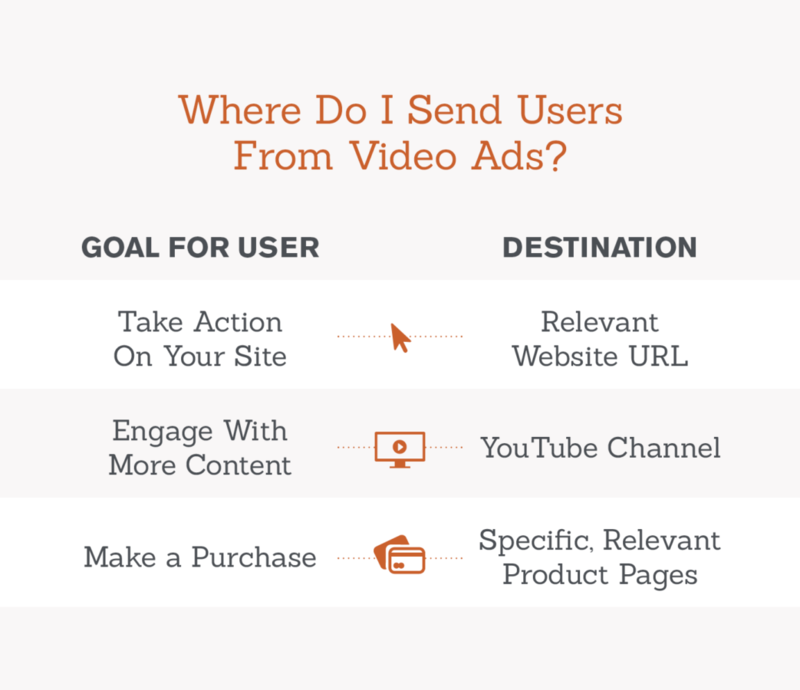 Whether you direct users to your brand’s website or your YouTube channel, the destination should be related to the goals for your YouTube video advertising strategy. For example, if your video is advertising a new product, you’ll want to direct users to a relevant URL on your website that contains details about this new product so the user can learn more or purchase the product. If you want to grow your brand’s audience on YouTube, send users to your YouTube channel. Within Google Ads, advertisers can build video campaigns with several different YouTube ad formats to choose from. It’s important to choose a format that best aligns with your end goals. Keep reading to learn about each format and when to use each. With TrueView Ads, the advertiser is only charged when viewers watch or interact with certain parts of your video. You can choose from two overarching types of TrueView Ads: In-Stream or Video Discovery. Description: Run before, during, or after feature videos on YouTube or on partner sites and apps. They give viewers the option to skip the ad after 5 seconds. 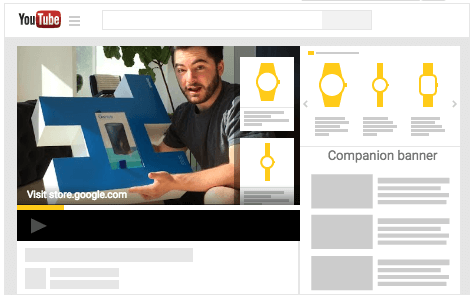 When to use this YouTube ad format: Use TrueView In-Stream (with a static companion banner) when you want raise brand awareness and advertise to your target market where they are already engaging and watching videos. When you’re charged: When a viewer watches 30 seconds of your video (or the duration if it’s shorter than 30 seconds) or engages in other video interactions, such as clicks on the call-to-action overlays (CTAs), cards, or companion banners. Where the ads appear: TrueView In-Stream ads can appear on videos across YouTube and on video publisher sites, games, and apps on the Display Network. However, you can adjust settings to only show ads on www.youtube.com, as well as apply content exclusions for brand safety. Description: TrueView for Shopping ads are the same as TrueView In-Stream ads, but with one important difference: Instead of using a static image as a companion banner, an advertiser can utilize its Google Merchant Center product feed to show relevant PLA ads alongside the video ad. When to use this YouTube ad format: Use TrueView for Shopping when you want to highlight products shown in the video via PLA, making it easier to users to buy that product. Additionally, this tactic works well with dynamic remarketing to remind users of items they have browsed before or may even have sitting in their cart! When you’re charged: When a viewer watches 30 seconds of your video (or the duration if it’s shorter than 30 seconds) or engages in other video interactions, such as clicks on the call-to-action overlays (CTAs), cards, or PLA. Description: TrueView for Action ads are also the same as TrueView In-Stream ads, but with one important difference: Instead of using a static image as a companion banner, an advertiser can add a 10-character call-to-action button to the companion banner, making it more prominent for users to click. When to use this YouTube ad format: Use TrueView for Action when you have a very specific call to action you want your potential customers to make, such as fill out a form, book a room, etc. When you’re charged: When a viewer watches 30 seconds of your video (or the duration if it’s shorter than 30 seconds) or engages in other video interactions, such as clicks on the call-to-action overlays (CTAs), cards, or call-to-action button. Where the ads appear: TrueView In-Stream ads can appear on videos across YouTube and on video publisher sites, games, and apps on the Display Network. TrueView for Action is particularly effective on mobile, where the call-to-action button is featured more prominently than a static companion banner. However, you can adjust settings to only show ads on www.youtube.com, as well as apply content exclusions for brand safety. Description: A bumper ad is a short video ad that plays before, during, or after another video on YouTube or the Display Network. 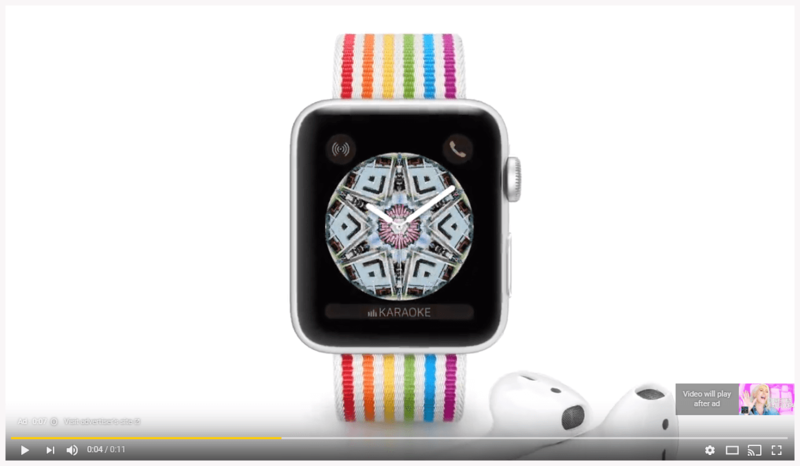 The video must be six seconds or less and viewers don’t have the option to skip your ad. When to use this YouTube ad format: Bumper ads are best used to compliment a TrueView campaign or as a remarketing tactic to provide a brief reminder to existing and potential customers to put your brand at the top of mind. Where the ads appear: Before, during, or after feature videos on YouTube and the Display network. Description: TrueView Discovery ads do not appear before a feature video, but rather are placed around YouTube based on keyword or demographic targeting, that a user can choose to view. 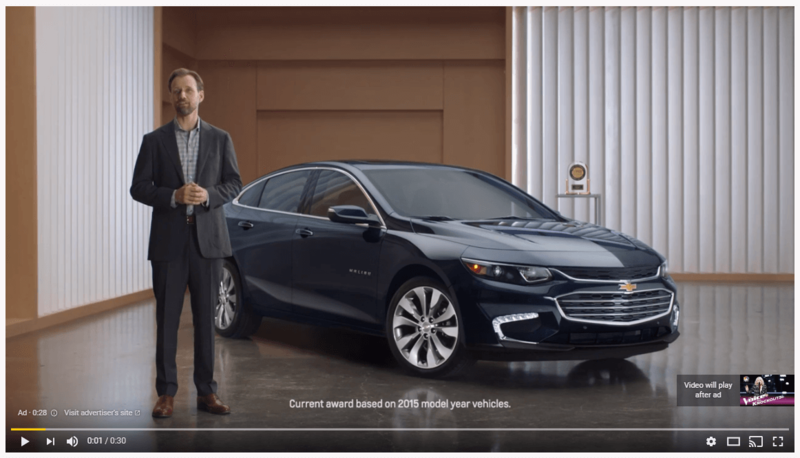 When to use this YouTube ad format: When your brand wants to capitalize on the naturally occurring discovery process that happens millions of times per day. Since the placement of TrueView Discovery ads can be dependent on the keywords of a user’s search query, it is easier to target your ads to more relevant users. Google reports that YouTube discovery ads drive nearly five times more clicks on CTA’s than in-stream advertisements. When you’re charged: You’ll be charged when a viewer clicks your ad and begins watching your video, no matter how much of the video they watch or what further actions are taken. 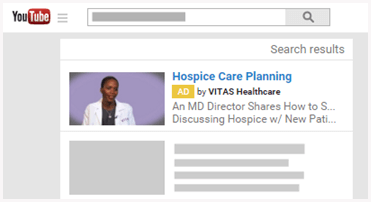 Where the ads appear: TrueView Discovery ads can appear on YouTube search results, next to related videos, and on the YouTube mobile homepage. Seer best practice is to create campaigns by ad type to control budgets and performance. Video ads provide much different user experiences on mobile vs. desktop, so Seer also recommends segmenting campaigns by mobile device to optimize for these differences. Read more about video ad performance here. Before your video campaign goes live, make sure you’re set up for success and ready to properly measure conversions, performance, and gain audience insights, In Google Ads, advertisers are able to view a summary of the video campaign’s performance, which will help you to optimize according to what’s working and what’s not. This summary includes metrics such as View Rate, Clicks, CTR, and even view completion percentages. Before your brand runs a video ad, you want to ensure that you have Google Ads conversion tracking implemented correctly to accurately measure performance. 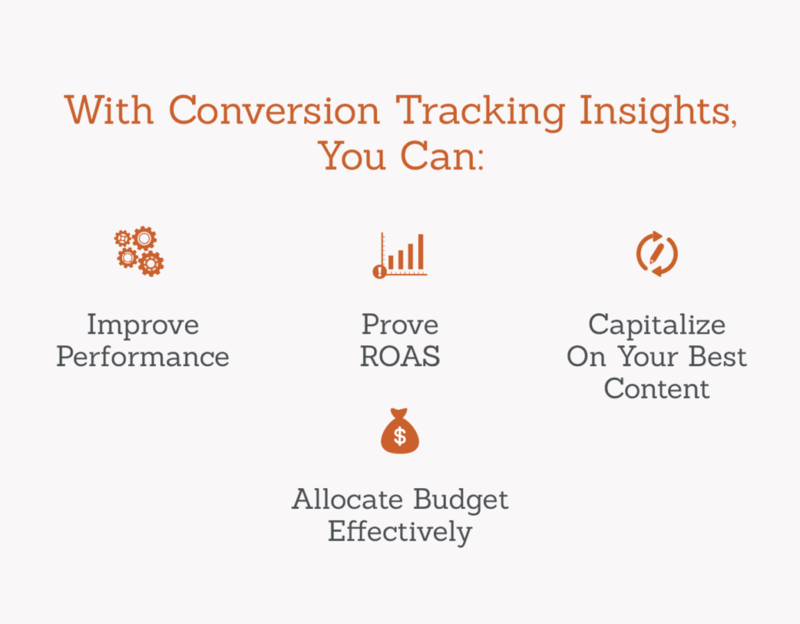 Conversion tracking will also help you stay on top of whether you’re achieving your goals. You can use Google Ads conversion tracking to track the people who click on your video ad and ultimately perform the desired conversion action. Improve campaign performance because you are able to understand what strategies perform well. Prove the ROAS (Return on Ad Spend) for YouTube Paid Advertising efforts. Better understand which content resonates with your audience so you can further promote it and create new content later that is similar. Understand how you should be allocating budget to specific videos, ad groups or campaigns. So you’ve decided that it’s time for your brand to leverage YouTube ads. You’ve set your goals and figured out which metrics to track success with. Now what? You need to learn how to create a YouTube ad campaign! Note: Google Ads updates their UI and settings options often, so some settings or features may change when you go to create your own video campaign. 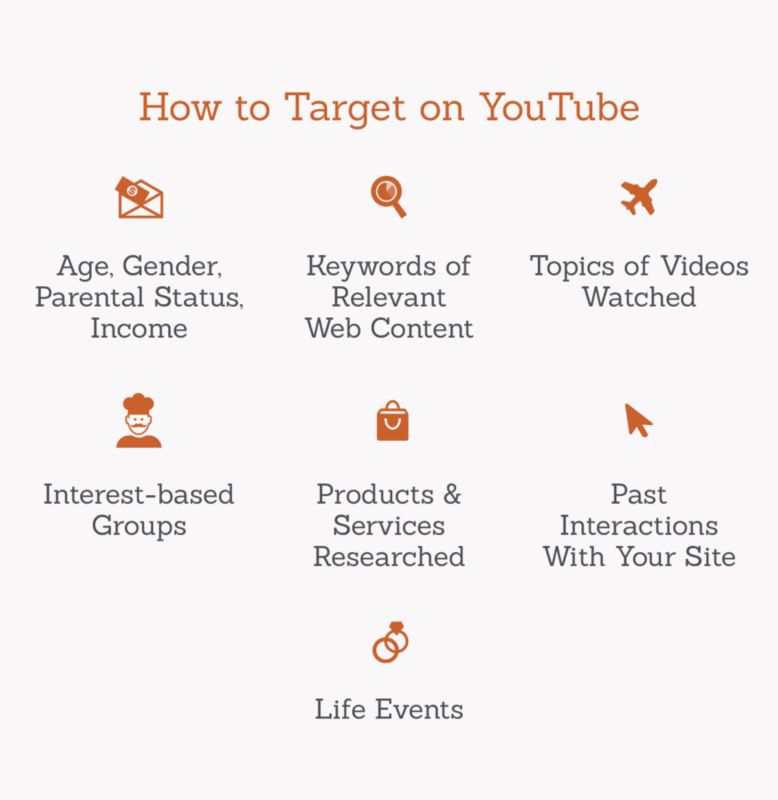 YouTube provides the opportunity to reach your brand’s target audience through an array of audience targeting capabilities. In addition to the standard Google Ads targeting settings, like language, location, and device, you can also reach people by targeting specific demographics and interests. YouTube and the Display Network offer a variety of ways to reach particular audiences. Demographic: Reach people by age, gender, parental status, and household income. Keyword Contextual Targeting: Target keywords that will help match your ads to web content. This works just like contextual targeting on the Display Network. Affinity Audiences: Select from interest-based groups to reach potential customers at scale and make them aware of your brand. Custom Affinity Audiences: Your brand can create audiences that are more tailored to your brand, compared with broad, TV-like audiences. For example, rather than reaching sports fans, a running shoe company might target avid marathon runners. Remarketing: Reach viewers based on their past interactions with your website, videos, or YouTube channel. If you’ve linked a YouTube account to a Google Ads account already, we’ll create custom ones for you automatically. Life Event Targeting: Target users identified via their search & browsing behavior as going through a major life event such as graduating, moving, or getting married. To choose the right audience, use Google Analytics and Google Ads audience data to see what interests and demographics are most highly associated with viewers of your website. Layer multiple targeting methods together to get the most highly relevant audience. Unlike search or display campaigns, video campaigns rely on a Max CPV instead of a Max CPC. As mentioned before, a Max Cost-Per-View (Max CPV) is the most your brand is willing to pay for someone to view your video. According to Google, a view happens when someone either watches at least 30 seconds of your video ad (or the duration if it’s less than 30 seconds) or interacts (such as clicks on overlays, companion banners, etc.) with your video. Often, your brand will pay less than the full Max CPV, due to theGoogle Ads Auction, and pay the Actual CPV. An Actual Cost-Per-View (Actual CPV) is the actual amount your brand actually pays for a view. Google Ads will only charge enough to get the ad to appear on the page. Whereas the Average CPV is the average amount your brand will pay for a view. At a minimum, your brand’s Max. CPV must be $0.01. You can determine your Max CPV based on the reach estimates that Google provides as you select targeting settings and a max. CPV when building a new campaign. You can also base this on what you know about your business and the value of a view. For example, we saw an Avg. CPV of $0.05 and the highest Max CPV was $3.11 across all of the video campaigns for Seer’s clients from January 1st, 2018 – May 29th, 2018. When creating a campaign, you also have the option of setting a Popular videos bid adjustment. This optional bid ranges from +0% to +500%. It can increase your chances of being shown alongside popular content, but at a greater price. Top Content is leftover inventory from guaranteed buys on YouTube’s most popular 5% of channels among U.S. 18-34 year olds, including creators like Michelle Phan. Campaign Goals: What goals are you trying to achieve with this video campaign? Max CPV: How much are you willing to spend for someone to view your video ad? Views: How many views do you want on your video? Campaign Duration: How long is the campaign running? Your total budget should be determined by your daily budget times the amount of days your campaign will be running. For more tips on optimizing your video campaign and maximizing budget, check out this section of Google’s Video Advertising assessment study guide. Alright! Now that you’ve finished learning about how to promote your video, it’s time to take a look at analyzing your video’s performance or pop back and compare your YouTube PPC know-how against some best practices for optimizing your video. What types of decisions can I make by monitoring video performance? So, you’re thinking of monitoring video performance. And you should. Video is a strong channel that fulfills a variety of functions, starting from raising awareness all the way to generating conversions by driving users to your site. Users who come to your site from video may prove to be a valuable consumer base. And, with that base in mind, it’s important to think about how to leverage video data to implement actionable changes to your site and strategy. For instance, you may want to include a CTA at specific drop-off points to drive visitors to your site before they may have left the platform. By optimizing with a CTA in such a way, you encourage these viewers to explore your website and possibly convert. Certain types of video may resonate more strongly than others, and it’s important to be able to understand what’s driving video performance to be able to apply these learnings appropriately. 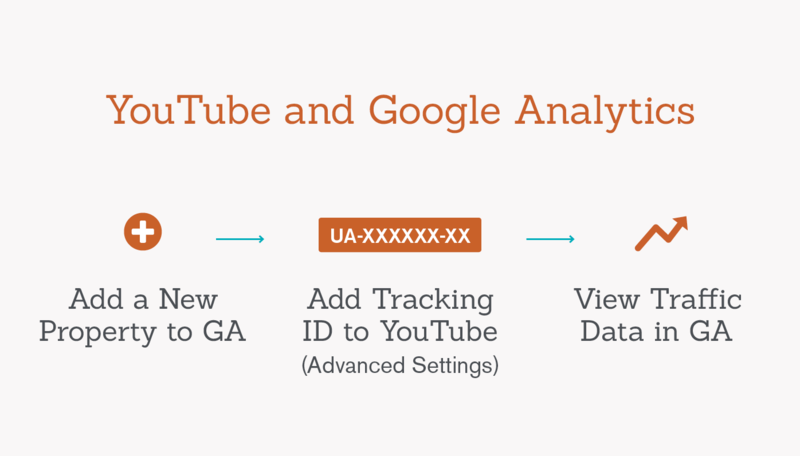 The YouTube/Google Analytics integration consists of creating a new Property in Google Analytics for your YouTube account, and then connecting the Tracking ID to your YouTube Account. This will allow you to gain an understanding of what traffic channels are driving users to your YouTube channel, how often users are visiting your channel, information on return visits and visitors, which pages and videos are most popular as well as which geography related data. You can access this information in the view for your YouTube Google Analytics property, and the report functions like any other Google Analytics report. A more complex and nuanced way of collecting data for YouTube videos is by way of UTM parameters. We’re big fans of this approach here at Seer! 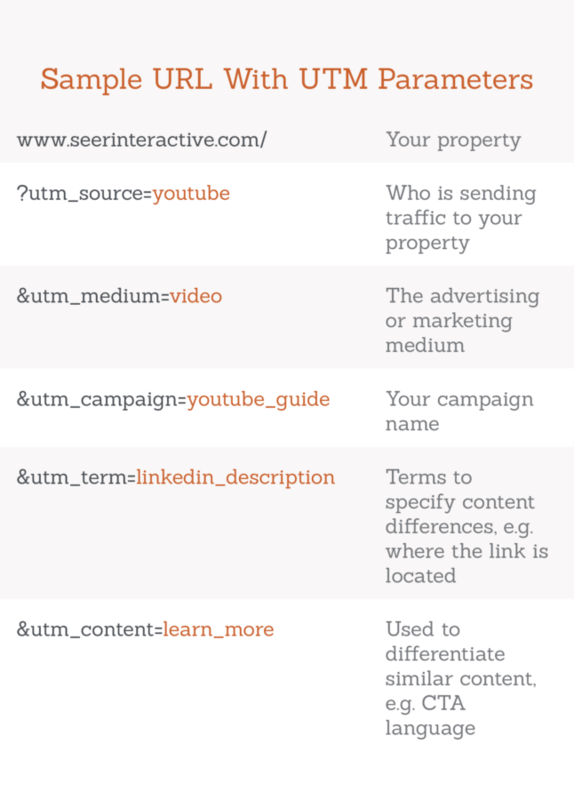 UTM parameters are tags that can be added to the end of a URL that allows the URL to be tracked whenever someone clicks on it—for example, the URL card in the video below that drives to seerinteractive.com. The data is then passed along to Google Analytics and can then be viewed within the platform and analyzed. Simply put, UTM parameters allow for brands to track their video and marketing efforts within Google Analytics, giving them the opportunity to drill down to do a deeper analysis of performance between different videos and content. utm_source: Identify the advertiser, site, publication, etc. that is sending traffic to your property, for example: google, newsletter, billboard. The utm_source for a YouTube video campaign would contain “youtube”, for example, or something that identifies that the click is from a YouTube video, specifically. utm_medium: The advertising or marketing medium, for example: cpc, banner, email newsletter. An example utm_medium for a YouTube video would be “video” for clicks coming from an actual YouTube video, versus an example utm_medium for clicks coming from elsewhere in YouTube, such as description cards could be “referral”. utm_term: Identify paid search keywords. If you’re manually tagging paid keyword campaigns, you could use utm_term to specify the keywords that the user is coming in through. However, this field is flexible and you should use whatever data point you think will help you make a better analysis. In some cases, we’ve used the link location as the parameter here to specify where a user is clicking from if there are multiple links on the same page. Think through what you might want to track and leverage it in these more flexible parameters. For instance, if you have a link in your description and a link in your video, you would have two URLs with two separate utm_terms, e.g. utm_term=descriptionlink and utm_term=videolink. utm_content: Used to differentiate similar content, or links within the same ad. For example, if you have two call-to-action links within the same email message, you can use utm_content and set different values for each so you can tell which version is more effective. For instance, if you have two different CTA’s in the same video you could put the CTA in the parameter to analyze which is more effective. Once your parameters are set, they can then be analyzed in Google Analytics in the campaigns reports by looking at Source, Medium, Source/Medium, Ad Content, Ad Term. Aside from having video content directly on YouTube, there is an option to embed YouTube videos on your website. However, you’ll want to make sure you’re adding the appropriate tracking to collect data on YouTube video interactions on your own website. Google Tag Manager contains a built-in YouTube video tracking trigger and accompanying variables. These variables allow you to tag video interactions for embedded YouTube videos with no custom coding required. Well, almost. GTM’s built-in YouTube tagging only partially supports embedded videos and it’s a slightly more complicated process. Seer created an easy-to-implement small script that can be loaded via GTM on pages with embedded videos (for more information on GTM, read our beginner’s guide to GTM here). In terms of reporting, Google Analytics advanced segments provide a powerful way to report on YouTube performance and how it translates to on-site behavior. YouTube data can be identified by going to Acquisition > All Traffic > Source/Medium and then searching for YouTube as the source (or however you have chosen to identify YouTube through the utm_source parameter). Using this source/medium, you can build a custom segment in Google Analytics that lets you analyze on-site behavior of users coming in through YouTube. Additionally, you can also filter down to individual videos by adding in conditions for the remaining 4 utm parameters, isolating specific content, and analyzing performance for each individual video. The YouTube segment can be applied to all of GA’s standard reporting capabilities to understand what page paths users are taking, what their on-site interactions are (depending on the type of event tracking you have set up), and where they’re leaving the site. You can get even more granular and drill all the way down to lower funnel conversions, including goal completions and ecommerce transactions if your website has Enhanced Ecommerce enabled (something else Seer can help with). Combined with UTM parameters, as well as GA’s advanced segments, you can unearth significant, actionable information about your YouTube visitors that can lead to on site optimizations, content ideas, and audience insights. Aside from GA’s reporting, there are a couple of elements that are especially interesting within the YouTube Analytics platform itself that we’d like to call out. These reports provide data regarding user watchtime—right down to the specific minute so you can see where users are dropping off in your video. You can then use specific CTAs to keep them engaged or drive them to the site before they drop off. It’s a powerful way to keep your users engaged or drive them further down the funnel. This tells you where users are coming to your site from and can be a useful indicator of whether they’re searching for your video or finding it organically through related content. If they’re coming to your video through related content, that can be used to generate additional content ideas. Now that you’ve learned more about tracking and analytics best-practices for your YouTube videos, you can use it to bolster your knowledge of optimizing current and future videos and gaining a deeper understanding of goals and KPIs to look for when promoting your YouTube video ads.